Wyden was a U.S. representative 30 years ago; he praised Bush's 'decency and civility' and Bush's restrained reaction to the 1989 fall of the Berlin Wall, the subject of a book by Wyden's father. U.S. Sen. Ron Wyden paid a brief tribute to former President George H.W. Bush, who died Friday at age 94. Wyden, a Democrat, was in his fifth and sixth terms in Oregon's 3rd District congressional seat. He turned 40 just as Bush became president in 1989. 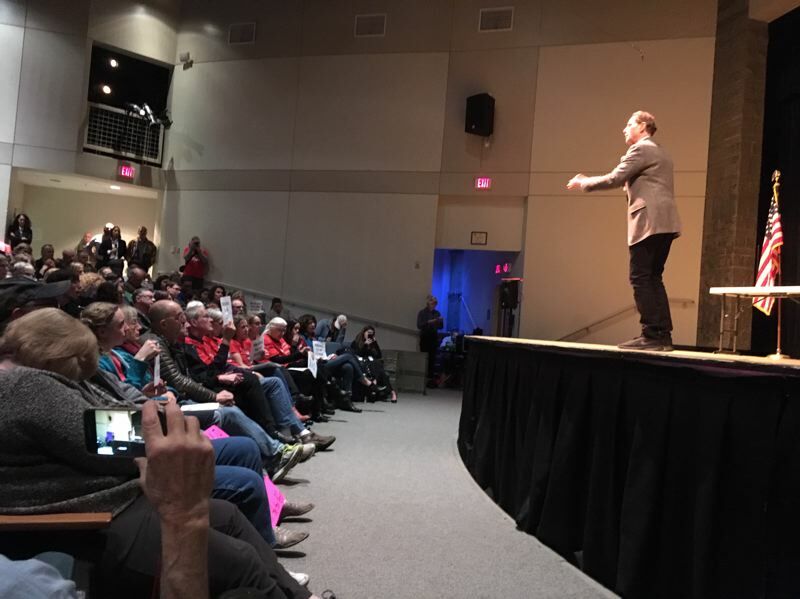 Wyden's remarks Saturday at Rex Putnam High School in Milwaukie were interrupted by a shout from the town hall audience, "He killed millions!" "What I remember about him — I was a young congressman then — was his core decency and civility. I disagreed with him on many issues, particularly issues that may relate to the comment that was just made on military policies. I disagreed with him on plenty of issues. "But I remember about him something we see at these town meetings — and that is Oregonians' decency, civility and respect for every single person, no matter what their views are." Wyden also had a personal observation. He praised Bush's restrained reaction to the 1989 fall of the Berlin Wall, which became the symbol of a Germany divided between democracy and communism after the defeat of the Nazis in 1945. Wyden's father Peter, who fled Nazi Germany with his parents in 1937 and became a journalist and author, published "The Wall" in 1989. "George Bush was pushed at that time to take a kind of victory dance for the Wall going down, based on the proposition that meant the United States had won the Cold War," Wyden said. "But Bush wouldn't do that, because he said if he did that, it would embolden the KGB and the (Soviet) hard liners — and the world will be less safe. My dad, who wrote that book, appreciated it — and so did I." Vladimir Putin, Russia's current president, worked as a foreign intelligence officer for the KGB for 15 years — the last six in East Germany — before he retired in 1990. That same year West and East Germany reunited as one nation.